Whitehead, N. E., and Ulusoy, U. (2015). 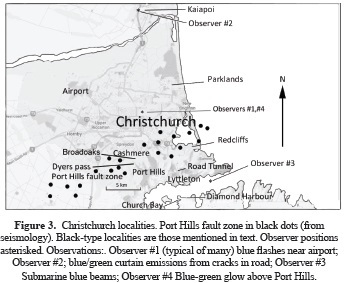 Origin of Earthquake Light associated with earthquakes in Christchurch, New Zealand, 2010-2011. Earth Sciences Research Journal, 19(2), 113-120. http://dx.doi.org/10.15446/esrj.v19n2.47000. Earthquake light (EQL) mainly blue-white flashes from the ground, was observed coseismically during a New Zealand M7.1 earthquake, (4.47 am 4-Sep-2010 local time). A local production mechanism is most probable. The blue-white flash observations support the Freund et al. mechanism, i.e. shockwave disturbance creating electronic "holes" from ruptured peroxy bonds in quartz, and subsequent surface positive charge from the ground, followed by light emission during neutralization. Examination of video records shows the flash median length is about half a second and needs to be differentiated from the light during electricity supply short circuits. Observed ground-level white colors appear to result from very intense non-specific air ionization. Blue colors seem to be nitrogen emission with a short lifetime, succeeded by green oxygen emissions with longer lifetime followed by much lower intensity red. These were created by transient low-to-moderate voltages and probably include significant UV production. The maximum likely radiation dose is small, restricted to the skin, and equivalent at most to a few months natural background radiation. Calculations confirm the release of 222Rn is not the major mechanism for creating earthquake light, and would contribute minimal radiation dose. Other unique observations are: streamers of light changing from blue to green as they passed from west to east, vertical sheets of blue-green light from cracks in an asphalt road surface, created by local shockwaves and shearing forces, daylight observation by fishermen of rapid linear undersea travel of blue light seconds before a 2011 M6.0 aftershock, and a mid-day green-blue glow over nearby hills containing a fault zone, shortly before the further destructive M6.3 earthquake, (12.51 pm 22-Feb-2011). Keywords: Earthquake light, earthquake precursors. Las luces de terremoto o EQL (del inglés "Earth Quake Light") son principalmente azul blancas y fueron cosísmicamente observadas durante un terremoto de magnitud 7.1 en Nueva Zelanda (4:47 a.m., 4 de septiembre de 2010, hora local). Es muy probable que el fenómeno haya sido producto de un mecanismo local. Las observaciones del destello azul blanco coinciden con el mecanismo de Freund y otros, esto es, la alteración de un movimiento sísmico que crea "agujeros" electrónicos a partir de lazos de ácido peroxi rotos en cuarzos, con carga positiva superficial consecuente del suelo, y seguida por la emisión de luz durante la neutralización. La revisión de grabaciones de video muestra que la duración del destello es de cerca de medio segundo y debe ser diferenciado de la luz generada por los cortos circuitos del fluido eléctrico. Los colores blancos observados a nivel del terreno parecen resultar de una intensa ionización aérea no específica. Los colores azules serían emisiones de nitrógeno con un corto período de duración, sucedidas por emisiones de oxígeno verde de mayor duración y seguidas por un rojo mucho menos intenso. Estos colores fueron creados por voltajes transitorios de bajo a moderados y probablemente incluyen una producción significativa de radiación ultravioleta. La cantidad de radiación máxima probable es pequeña, restringida a la piel, y equivalente a unos pocos meses de radiación natural regular. Los cálculos confirman que la liberación de 222Rn (Radón) no es el principal mecanismo para crear las luces de terremoto y que este contribuye con una mínima cantidad de radiación. Otras observaciones únicas hablan de rayos de luz que cambian de azul a verde mientras van de oeste a este, de cortinas verticales de luz azul verdosa que emergen de grietas en la carretera, creadas por movimientos sísmicos y fuerzas de corte; de observaciones de pescadores a luz del día del trayecto subacuático, rápido y lineal, de una luz azul antes del movimiento sísmico de magnitud 6.0 de 2011, y de un resplandor verde azuloso a mediodía sobre las colinas cercanas a una zona de fallas momentos antes del destructivo terremoto de magnitud 6.3 (12:51 p.m., 22 de febrero de 2011). Palabras clave: Luces de terremoto, precursores de terremoto. EQL is mainly flashes of light or glows associated with earthquakes, but because of its transient nature has been treated sceptically by scientists. Following capture on film and webcam/security cameras, it is now accepted as real by most seismologists, as judged by the published literature referenced in this paper. There are, by our count, about half a dozen videos available on the internet, (e.g. an aftershock reported by the BBC in Sendai, Japan: http://www.youtube.com/watch?v=5hRgqLu3y_Y, and in Lima, Peru: http://www.pucp.edu.pe/inras/peru-magneto/mod-3cam-3.exe). Most show a white spherical ground-based core surrounded by radiating blue-white light, fading the further it is from the core. There are now thought to be numerous valid records throughout history (Derr, 1973), (Stothers, 2004), (Thériault, St-Laurent, Freund, and Derr, 2014), though the origin is still argued, (Straser, 2007), (Fidani, 2010), (Fidani, 2012), (Freund, 2011), and may be multiple. EQL has been observed before in New Zealand ((Aimuri, Hutton, 1888); (Reefton, Anonymous, 1888a; Anonymous, 1888b); Wellington, 1943, green aerial explosions over the sea (personal communication Edith Costello, 2012), (Grayland, 1957); Inangahua 1968, coseismic orange glow, less than 15 min (Personal Communication W. Inwood, 2012)) the references give only superficial descriptions; locations are found in figures 1-3. However, we are still at an early stage, where many more observations should be collected and analysed. This paper attempts to add to the collection and supply some interpretation. 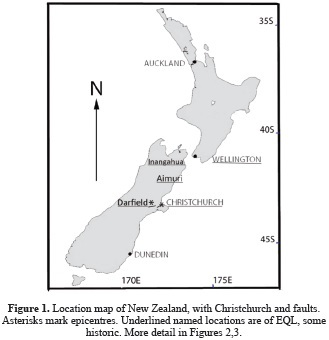 Two large earthquakes in Christchurch, New Zealand contributed four unique observations that support some explanations of EQL origins in the literature, particularly work by Freund et al. (2009), Thériault et al. (2014). New Zealand is earthquake prone because of its tectonic setting on the "Ring of Fire" (Stirling, 2002). Christchurch is a city of 377,000 people on the east coast of the South Island of New Zealand at 43º S (Figure 1). An M7.0 event (4-Sep-2010 at 4:35:47 AM local time, 16:35:47 UT), had an epicenter 12 km deep, near Darfield, 42 km west of Christchurch, on the Greendale fault (Quigley et al., 2010). This main event produced most of the reported EQL. There were many thousand aftershocks (Bannister and Gledhill, 2012). A later event triggered by the first earthquake (Stramondo et al., 2011), was on 22-Feb-2011, at 12:51:42 PM, local time, 23:51:42 UT, M6.1, 6 km deep (USGS, 2011) and very close to Christchurch, on the Lyttelton or Port Hills fault (increasing detail in Figures 1, 2, 3). The city is mostly on a broad river plain of sedimentary greywacke gravel and silt (Suggate, 1958). The only igneous rocks are the 500m high Port Hills - eroded remnants of a 10-12 Ma-old basalt volcano (Stipp and McDougall, 1968), outside the city to the southeast, within which is a 15km long inlet from the northeast, parallel to the Lyttelton/Port Hills fault (Figure 3). The basalt is underlain by Torlesse terrane, which is a New Zealand mixed sedimentary and metamorphic rock (Forsyth et al. 2008). An appeal was made for earthquake experiences via a then-existing current affairs program ("Close-up") on national TV. The wording was "Many people have reported events they think are associated with a later earthquake. For example from animals, birds, plants or in the ground, water, or the air, sky, clouds, electrical appliances or from other events. If you experienced something like this, please visit the website whose address is on the screen". Results were mostly collected on a website specializing in surveys called SurveyMonkey. For other details including data on animal response, see the parallel paper (Whitehead and Ulusoy, 2013). For some of the observations, obvious questions arise, but most participants did not supply email addresses for follow-up questions. The sample was obviously biased towards the mentioned categories, but many coseismic accounts were supplied most of which mentioned EQL and were used in this paper. The sample will be biased towards the young and computer-literate, and is clearly not representative, but this will not matter for the phenomena described. Consideration of reported daylight rainbow segments in clouds was deferred and is not included. There were nearly 400 usable replies given to the survey, of which 42 mentioned EQL for the September 2010 event. EQL descriptions were also collected from an unrelated website specializing in meteorology. Most people in the city saw brief blue/white coseismic flashes of light surrounding a white core, somewhere near the airport, and a minority, further away, reported a few red colors. The most intense light was a large white flash after tens of seconds of shaking, near the city, rather than at the epicenter 40 km distant. Many similar reports were given for aftershocks. The light was captured on security cameras at the Christchurch/Lyttelton road tunnel (Figure 3), Princess Margaret Hospital, (central Christchurch), and one less official video, incorporated in a subsequent film documentary, When a City Falls, distributed by Frank Films (New Zealand Film Commission, 2011) the latter available for time analysis, frame by frame. For four flashes, the median length was 0.12 sec (see discussion section). *Mainly coseismic: Vertical sheets of blue/green light from road surface (same event as 3). *Preseismic: Blue-green haze on hills in daylight (Feb-2011 only). Detailed accounts are available from the first author or at: http://www.chchquake.co.nz. In the following, similarly in appendix 1 with representative accounts, some spelling has been regularized. Editorial comments are in square brackets. A typical description is first, then the four unusual observations. I was driving into Christchurch on the morning of the quake. [southwards] .....4.35am. The sky lit up with an incredible lighting display. I knew it was an aurora. To my left, east, ...[ see Figures 2 and 3] flashing dark green to light green as it moved away from me. To my right, west, light blues to dark blue. The display was 'sheeting'. I have seen auroras on TV, and that is what it was. This was not lightning. My car clock clicked over 4.36am, just seconds into the aurora, and the car lurched and tipped and shuddered. The force was enough to have tipped my car over, but due to experience I managed to steer into the shudders. The lights of the motorway were still on. [i.e. this was not yet power-line arcing] 'Rivulets', or wriggles, were flashing towards me from the south west, like a giant spider web, or 'radials', ... I would guess that the centre of the spiderweb would have been .... [...Darfield direction, Figure 2, but about 20 km further away]. Two 'rivulets' flashed passed me on either side, straight into Kaiapoi which was on my immediate left, east. The lighting display suddenly became incredibly intense, and was not 'in the distance', it was all around me. Then with the violent shuddering of the car, there was a HUGE flash of brilliant white light, and the display vanished, and the whole city sank into blackness [The car functioning was not affected. Kaiapoi (Figure 3) is 17 km N. of Christchurch.]. The light display appeared first .... As the colours changed they moved away, or, as they moved away the colours changed. Greens on my left, east, blues on my right, west. The brilliant white light was directly over the city. The range of the light extended right out to sea, east, into the whole distance I could see. I was 'inside' the light [and it was hugging the ground, about car height]. ...If you could imagine a flat concertina. The radials [= rivulets, earlier] advanced across the road in front of me, from southwest to northeast, and they moved as fast as I could take in the spectacle. The radials were not uniform in that I saw some which appeared to be behind/ahead of others. Each radial, ... was each, ker-bump, and a ker-bump, with me travelling south at 100ks per hour. On each side of each radial, the road moved in opposite directions, like a push-pull effect [shearing forces in the asphalt]. As I passed over each radial, the car lurched the other way. Each radial looked strangely like the pictures of gophers burrowing along, where they leave a little upraised trail. But there were no open cracks as appeared later. I would guess that the motorway was swaying inside a channel of about one meter overall in the distance I could see. The lights of the motorway were still on until the last tremor. The lights of the city vanished basically simultaneously with the aurora. This correspondent also reported feeling for a few days as though he had been sunburned (discussed below). "I was looking out the front of the boat and I saw a couple of blue flashes down in the water, was definitely a flash, a dim blue flash. "The blue flashes were about 100 meters to the side of the vessel and shot from left to right in a straight line across us. Then the next minute it was like the boat hit something. "[earthquake shock wave from a M6 aftershock (Gorman, 2011)]. The flashes were also described as rather milky blue, like the subaerial September events, but visible in daylight. There were two "rays" about 10 m apart which vanished into the distance. The depth was less than 12.4 m, (Port Company, 2013) and the surface is soft sediment. The time between the observation and the shock was a few seconds. The earthquake was M6.0 and 10 km under Lyttelton, on the Port Hills fault zone. Observer #4 There was a blueish green glow in the sky just before the quake started [Over the Port Hills to the southeast and above the fault zone. About 30 minutes before the M6.1 quake (12:51, 22-Feb-2011), glow visible even though it was midday; no duration noted. Weather cloudy]. In the present paper, we have accounts of at least four unique and remarkable observations. However, there is no reason to doubt their content; observers gained little or nothing by reporting them, and in some cases were reluctant to report them because of their strangeness, until they realized that there was historical precedent. Related events in the literature were unknown to the observers. Most colors at Christchurch had a white core (200m?) fading to blue-white further out, as described in the literature (Briggs, 1999), (Freund, 2003), (Ikeya, 2004), with a few reports of green and red (only in the sky). Other colors figured much less prominently. In general for the M7.0 quake the bluer colors were reported as being towards Darfield, the epicenter, any green tending to be well away, and possibly over the sea to the east. From eyewitness reports, there were perhaps as many as six blue flashes, culminating in an intense white flash of large but uncertain extent (probably a larger version of the blue-white flashes), then a general electricity shutdown. Another Christchurch report was of a coseismic flash color like tungsten (incandescent) lighting. There were also reported preseismic glows, perhaps hours long, mostly on hills at night, as reported in the previous literature for other earthquakes (Tsukuda, 1997). As for many New Zealand earthquakes, there was a train-like rumble heard well before the first p-wave, and even before the earthquake origin (Figure 4) which is puzzling. This also happened before aftershocks. This paper endorses a previous explanation (Gordienko et al., 2008); pre-seismic rumble may originate from very numerous microcracks produced by pre-earthquake strain over a large area. Video evidence will be biased in favor of recording the blue-white flashes because they have the highest intensity. Glows are much less intense and will require long exposures to register (about 30 seconds, see Long (2014) for similar difficulties with aurora detection). Neither video facilities nor security cameras will record them, so eyewitness accounts will continue to be important. The Christchurch median flash length was 0.12 s from a frame-by-frame analysis, using the 7 Movie Maker program, compared with similarly derived medians of 0.56 s for an event in Lima, Peru (hyperlink in Heraud and Lira (2011)) and 0.22 s for Sendai (BBC, 2011). Chile data (Taylerburdeen, 2010) appears similar. All are much longer than conventional lightning (10-50 µs) and a good rule of thumb is about 0.5 s. Since some earthquake lights are several seconds in length, they are perhaps best described as short glows. For Luenser (2013), and Anonymous (2013) which were superficially similar, but were known to be electrical flashes rather than earthquake light, the analysis gave respective medians of 0.43 s (115 points) and 0.89 s (12 points). Using MonteCarlo statistical methods (e.g. Robert and Casella, 2005) it was shown the electrical and genuinely earthquake data could not be distinguished. The possibility of transformer arcing must, therefore, be checked for all assertions of earthquake light observations. For the September quake in Christchurch (see Figure 4), the electrical distribution network was operating a logger, monitoring line voltage. Collating eye-witness accounts, the EQL appeared at least 10 seconds before the slightest preliminary line voltage fluctuations and were therefore not power supply arcing. No destroyed transformers were reported, which implies no destructive arcing during the whole episode. According to two good independent eyewitness accounts, flashes of light appeared 5-10 seconds in Darfield before the first main tremors (p-waves) in Christchurch. These flashes continued, but much nearer the city, until the power failure, and strong white flash (again much nearer Christchurch than Darfield). This confirms that EQL may be at least tens of kilometers distant from an epicenter. The EQL were coseismic, or a few seconds later than the first p-waves both for Darfield and Christchurch. For the strongest white flash, it could be a coincidence that this immediately preceded the power shut-down, but the simplest hypothesis is that an intense electromagnetic pulse contributed. More importantly this figure confirms some EQL need not be associated with voltage fluctuations in power lines, or arcing. This paper suggests blue, green and red colors arise from ionization levels in nitrogen and oxygen which are relatively long-lived and remain, though only for a few seconds, after the less specific ionizations have disappeared. The white core of the "lightning" looks identical to white air discharges caused by arcing, or malfunctioning in high voltage electrical sources (usually accompanied by some ultraviolet). This is non-specific ionization of air molecules. Individual colors are harder to explain, but this paper suggests they are from ionization events visible only because they are relatively long-lived. The blue colors at atmospheric pressure are known to arise naturally through de-excitation of nitrogen molecules, N2+1, to neutral nitrogen molecules (Wiberg, Wiberg, and Holleman, 2001) but have a lifetime of tens of nanoseconds only. The rarer green colors are due to ionization of oxygen and have a life of about 0.75 s, following which they are in a low but still excited energy level (Wiberg et al., 2001). See also Gartlein, Kimball, and Sprague, (1965). As oxygen passes to its lowest energy level with a very long 110 second lifetime, it emits red light. These data may be found in various standard compilations (e.g. Wiese and Martin, 1986). The colors are also seen in auroras (Sorokin and Chmyrev, 2014) but at ground level one would need a very intense primary ionization event of perhaps many tens of kilowatts per square meter. Could this give a significant radiation dose? The EQL themselves must correspond in energy terms only to eV, in the visible to ultraviolet region, and would deliver a dose only to the skin. Earth movement could not create higher energy radiation such as gamma rays. Observer #2 entirely surrounded by the white flash reported feeling sunburnt, possible if the blue-white flashes had strong UV output. Ionized air has a strong UV emission component from atomic transitions in ionized nitrogen (Anonymous, 2012), and electric arc welders must use UV protection. Conventionally (UNSCEAR, 1993), the penetrating radiation dose from inhalation of radon is 1 mSv y-1. If we assume that excess radon is released by pre-quake stresses and reaches 10x normal for 10 days before the quake (e.g. Igarashi et al., 1995), the dose might be 10/365*1 or 0.027 mSv. This is slight compared with the normal yearly radon exposure, and both these doses are negligible in exposure radiation terms. In contrast, normal levels of radon in cities caused through common atmospheric meteorological inversions are about 10 times higher than those likely from earthquakes (Ikeya and Whitehead, 2013). Different analytical treatment, (Freund, 2011) also concludes radon is not a factor in EQL. Thus, although ionizing events are occurring, the radiation dose is not critical. During the week before 4-Sep, static electricity was frequently reported, with local TV interference and other electronic glitches (Whitehead and Ulusoy, 2013). Before and after the 22-Feb earthquake, one respondent reported 5 minutes of local radio/TV static, though the broadcast signal was unchanged and continuous (Personal communication NZTV1). Another respondent reported this static for 4-Sep-2010, 22-Feb-2011, and 24-Mar-2012 quakes. This has been reported for other earthquakes (Wadatsumi, 1995), (St-Laurent, 2000), (Nagao et al., 2002), implying electromagnetic disturbance. However most importantly no thunder ever accompanied the EQL, implying quite low voltages compared with conventional lightning, i.e. much less than 30kV cm-1 (Lowke, 1992). Coseismic dimming and brightening of domestic lights was reported, and noted in available video material, which must be very local changes of electric transmission line voltages, and it seems at least some of this was before the line-voltage fluctuations recorded with the logger. Electric appliances not blown (Observer #6), suggests a maximum of several thousand kilowatts power variation associated with the earthquake light. Otherwise, the common 50 amp domestic electric circuit breakers would be activated. This means electromagnetic effects were involved, whether primary or secondary and were possible at Christchurch. This erratic dimming has been previously recorded for incandescent light (Terada, 1931). He also reported voltage fluctuations in a submarine cable during the Idu earthquake. Unusual auroral activity was absent. The account from observer #2 described light that occurred on asphalt and seems to have been generated by shearing forces in the asphalt itself or more probably from directly below the cracks. Notable is the description of physical forces on the car, coincident with the light, which does not seem to have been recorded elsewhere. This suggests very local seismic forces are strongly associated with these EQL. Although the previous literature suggests EQL are much more frequent near the igneous rock, the present observations show it can occur in asphalt, sedimentary rocks and unconsolidated gravels. However like igneous rocks, the gravels contain small crystals of quartz (e.g. Beggs, 1980) which is important for the most likely mechanism suggested below. The furthest observation (coseismic) was 65km north in the hills and above the hills of Scargill Valley (Figure 2), which again means local shockwaves or strain can generate this light. Most proposed mechanisms for the creation of high voltage potentials, and emission of ions apply only at the fault; (Terada, 1931; Lockner, Johnston, and Byerlee 1983; Hedervari and Noszticzius 1985). A piezoelectric origin for more distant influence has been considered (Derr, 1973; Takaki and Ikeya, 1998; Ikeya, 2004). The theory proposed slightly aligned quartz grains subjected to slowly varying pressure give rise to ULF waves that are one of the very few physical influences that can reach the surface from a deeply buried epicenter. At the surface, electrical fields were produced by these waves, and caused acceleration of local free electrons, creating the light, because ULF itself does not cause ionization. However (St-Laurent, Derr, and Freund, 2006), there are major difficulties with the model, i.e. two mirror-image forms of quartz will always occur in a 1:1 ratio and their piezoelectric effects cancel when there are many small crystals. Laboratory experiments (Bishop, 1981; Sasaoka et al., 1998), showed that rocks containing quartz gave a weak piezoelectric-like effect proportional to stress. Since under their test conditions, other rocks did not, their conclusion was that quartz was somehow involved, but the following work suggests that they were observing a unique mechanism in quartz that is called here "Freund-type". This model (e.g. Freund et al., 2009; St-Laurent et al., 2006) is based on extensive laboratory experiments in which high pressure on gabbro and diorite produced a flow of current to the surface due to rapid movement of positively charged "holes" in a quartz matrix from breaking peroxy-bonds that are a natural trace impurity (the balancing excess electrons produced do not move). The speed of movement of the holes may be 200 m sec-1. Currents were calculated to be in the range 5-100kA per km-2, and many thousand cubic kilometers of rock are probably involved in an earthquake. It is calculated that this creates an intense positive electric field at the surface, air breakdown/positive ionization, then dissipation of the charge (e.g. Freund (2011) and references therein). The recombination could give rise to the blue/white flashes observed, and UV. This model has experimental evidence from Freund for the creation of these voltages even in sand and soil, so this mechanism could, therefore, apply to the Christchurch gravels. It requires a return path for the positive charge to the trapped electrons under the ground, and the flashes in the air are part of this. Why was the largest white flash in the city itself, not at the fault, and 30 seconds into the decreasing shaking? This could be because of the severe soil liquefaction in many prone areas in the city, providing a sudden, aqueous, highly conducting return path for electrical charge. Individual light sources at Christchurch may have been 200 m in diameter, but if they were apparently generated 40 km away in Darfield, the implied very narrow beam at the epicenter seems quite improbable. Most physical mechanisms should have created wide-beam light spreading from the epicenter, particularly if it is ULF. Much more plausible is local stress in Christchurch creating local light sources. ULF with its widespread nature may be a better though indirect explanation for long-lived diffuse glows in the sky. Ground forces in the "ground aurora"
Accounts like the above "ground aurora" of observer #2, exist (Terada, 1931), (Derr, 1973), (Tsukuda, 1997), (St-Laurent et al., 2006), (Fidani, 2010) but mostly with scanty detail or with "streamers", rather than curtains. A closer parallel is a Quebec observation (St-Laurent, 2000). The colors produced at Christchurch had perhaps a few seconds lifetime and possibly a height of tens of meters, which could be consistent with other literature (St-Laurent et al., 2006). The sheets of light emerged from slight ground cracks, like a curtain. This sounds very much like the Freund mechanism and may be an example of it. The observer was in the middle of the white flash and not burnt or shocked electrically, but the Faraday cage effect from the car body makes magnitude estimation difficult. At Lyttelton, there was an appearance of light before the main shock. In this case, initiation was 10 km deep, but the resulting blue streaks were only 10 m apart, and at most several meters thick-perhaps a few percent of subaerial heights. The effect producing light has apparently penetrated upward through several meters of soft sediment. The milky-blue color again suggests ionization of nitrogen; the solubility of about 20 cm3 1-1 is not impossibly low compared with the 800 cm311-1 in the air. However a liquid medium would lead to very brief light compared to air, and since the light was a few seconds before the shockwave, unlike for the blue-white flashes, another mechanism may be responsible. There are other descriptions of marine light: (Derr, 1973; Kilbourne and Saucedo, 1981; Tsukuda, 1997; Soter, 1999; Stothers, 2004; Ulusoy and Ikeya, 2008; Granin et al., 2012) differing from each other and with little detail. (Heraud and Lira, 2011) described surface bluish-white vertical pillars of light from low-lying rocky islets but generation under the sea seems less commonly reported. The reported color corresponds with ionization of oxygen and nitrogen giving blue-green light. Longer-lasting pre-seismic night glows on or above hills have been reported for various earthquakes (e.g. Heraud & Lira, 2011). If these are coronal lasting glows they would depend on an unprecedentedly high dielectric constant in the earth at these extremely low frequencies (i.e. ULF), and this is uncertain, although the dielectric constant does increase very markedly as frequency decreases (Lockner and Byerlee, 1985; Ikeya, 2004). Glow characteristics are so different from the flash-type EQL that the mechanism is probably different. The hills supporting the glow were basalt (low quartz), so the underlying Torlesse terrane sedimentary/metamorphic rock could be more likely as a source. The most possibly useful premonitory earthquake light was diffuse glows on hills the night before the September event giving perhaps several hours warning. Unfortunately, this is a night phenomenon and relies on informed observers who are rare at present. However following such an apparent precursor it could be prudent to avoid old and glass-fronted buildings for a day or so. This needs many confirming instances before it is conclusively known to be useful. The present observations show four types of observation, production of light in a flash on the surface of the ground, change of rivulet/ray color from blue to green, production of light by earthquake impulses, leading to vertical curtains of light above shearing zones, and production without the impulses but due to moderate voltage phenomena which precede p-waves, and may be attributable to local preseismic strain. EQL does seem to involve ionization of nitrogen/oxygen which accounts for the colors seen. The actual dose of ionizing radiation is calculated to be very low. There may be some UV emission associated with the flashes, but electronic interference appears to be mainly radio/tv static. Possible mechanisms supported include the Freund model, particularly for ground-origin light, and ULF for glows in the air. General non-specific rather low voltage ionization gives a white color in the air and corresponding to atomic excited lifetimes, blue, green and red colors follow. Preseismic rumbles are consistent with the generation of preseismic strain. Sincere thanks to respondents to the survey for their accounts of EQL, and Orion Network personnel for the voltage-logger data and discussion. Gerard Smythe, for video analysis permission. Alan Wright for a detailed account of driving through the EQL, numerous correspondents for other historical accounts within New Zealand, particularly Edith Costello, Dr. Martin Reyners, Warren Inwood. Thanks to Gary Vallance for his account of the undersea light, and GPS coordinates. Thanks to Dr. Kassym Zhumadilov for some tests and discussion, Mrs. B.K. Whitehead for graphics assistance, Dr. Y. Ikeya for assistance with the Japanese literature, Mr. D. Chord for assistance with copying a Christchurch video EQL segment. #2. [Rolleston 6-9pm 3- September-2010] Blue light [seen] towards Darfield [This was for an extended time, at least many minutes, not a flash]. #3. I have seen exactly that, [blue light flashes during the September quake] at least 3 all in about 2 kilometers of [from?] each other and maybe 5 kilometers west of Parklands [Figure 3, tens of km from Darfield]. I was deciding whether I should jump out the window when I looked up from the first bright flash and observed the next two, one of which I swore had an arc of lightning leading to it. [This must be forked or arc lighting, rather than sheet lightning] ... all the light came from the ground. The one I got a good look at made an amazing amount of light in the form of a sphere on the ground. #4. ...there were no clouds, and the light seemed to originate from the ground. We live on Dyers Pass [eastern edge of the city] and could see flash after flash in the direction of the airport [west of the city and several kilometers away]. #5 I definitely saw the lights (looked a lot like lightning) ... We live in Broadoaks, Cashmere [eastern edge of the city] and what I saw was a blue-red color flash backwards & forwards across the sky. #6 We live in Redcliffs [eastern edge of city] and also saw the bluish-white flashes in the sky ... What we couldn't understand though is that our lights also flashed like crazy with blue/white flashes as if it was a power surge - but all our appliances are ok, which would indicate that wasn't the case at all?. #7 The other thing we observed on the CCTV footage was what appeared to be a type of lightning (Earthquake lightning)? Only it appeared to be coming out of the ground. Now that sounds weird I know, but members of the police on duty that night also reported it. [In the New Zealand context this would more usually mean sheet lightning rather than forked lightning.]. #8 [Church Bay, 50 km south from Darfield]. As the earthquake began the sky was lit up with bright blue flashing light... similar to sheet lightning. It appeared 'streaky' like the sun shining through clouds. #9 The other scary occurrence I would like to mention is, I awoke before the shaking, to the sound of what I can only describe as 'amplified static electricity' coming from my roof (it is iron), which at the time I retorted to my wife 'Jeez, what's that, hail?'. We then jumped out of bed and heard the 'train like rumble' people often now compare the EQ noise to. My son, downstairs, had his curtains drawn and was awake prior to the quake, he reported seeing blue flashes of light in the sky prior to the quake. #10 On Saturday night of the big quake my wife and I spoke with a work friend who said he was out driving at 4:35 am when he saw numerous blue flashes in the sky. I was skeptical about what he had seen until the following night. My wife and I were driving back from Blenheim home to Christchurch [southwards] when just south of Amberley [60km N of Christchurch] we both saw two blue flashes in the sky ahead of us. One slightly to the left and the later one to the right. A definitive earthquake phenomenon in our opinion. #11 Purple light glow the night before 4-September. Another witness reported coseismic near-indigo color towards the east, and another, coseismic purple clouds.